Most of the big search engines, email providers, social media sites, and other security-enhanced websites have a bounty reward program for geeks that figure out a way to hack the site. The logic is it’s better to reward the geek-hacker for hacking the site than to have them impose damage…it makes sense to me. In fact, this has become a popular hobby for many computer geeks and can provide an additional source of income. Rewards can go as high as $20,000 or more depending on the… The Travel Mama’s Guide! …severity of the security breach. But PayPal is refusing to pay the computer geek who hacked their site and revealed a security breach. Why you ask? Because their geek-hacker reward policy requires the hacker be 18 years of age, and this hacker was only 17. Are you blanking kidding me?! Isn’t this how villains are created? This kid hacked PayPal…a financial institution and they are going to stiff him? They are just asking for trouble, am I right? If I was running PayPal I would throw money at this kid and then hire him to work for me. Watch out PayPal…you asked for it! Geek Villain In The Making. My Schedule: I have an 11a meeting and another this afternoon around 1p. My Market Watch: Bonds Up! The 30-year bond is playing in positive territory since yesterday and today…sweet! Yesterday we picked up nearly +60bps and today another +10bps so far. 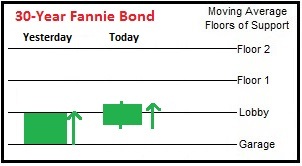 Moreover, as of right now the bond is trading above a previously established floor…the Lobby in my picture. This is good news because traders might look at this as an opportunity to continue to buy bonds…at least until it reaches the next floor up. If the bond continues to be bought we might even see a price improvement later…. I agree with you. If a 17 yr old IT kid can hack into PayPal…One that is ever so scarey that it was that easy and 2) The Feds should hire this kid straight out of high school to help with China hacking into the US asap!! !